Silos are the best way to add value to your grain. With it you can ride out the downs in the market, and sell when the price is right for you, without paying the rates that the cooperation charges you for storage and unloading. All silos are MFS silos, imported from Grand Island Nebraska, USA. Sizes start at 5 tons per silo and go up to 10,000 tons per silo. Loading and unloading can be done by bucket elevator, screw conveyor or grain pump. Below we've set out a few thing you have to look out for when considering a grain storage facility. ABC Africa offers a complete service, from start to finish, laying the foundations, integrating the community in community projects, erecting your grain storage facility and after sale support. About one and a half month before the physical erection of the silo, our team arrives at the site with their equipment and start preparing the site for the job to come. In this time the soil tests will be done and the foundation will be cast, the size and depth depending on the resistance of the soil and the size of the silo respectively. After the foundation has been cast, it is left alone to dry for a minimum of thirty (30) days. After the thirty days have passed, the team arrives once again, and erection of the silo can begin in earnest. Building their way up, sheet by sheet, the team assembles the silo. Just before the silos is complete, and the floors and aeration are being installed, the transport systems are installed, be it a bucket elevator, screw augers, a grain pump or an air transport system.After the transport system completed, and the silo is secured to the foundation, you're ready to start harvesting and loading your product. If a bin is aerated , the correct air volume and pressure should be selected for the type of grain. The correct floor and blower will accomplish this. Full floor aeration usually smaller diameter bins and drying bins. Flush floor aeration channels in various designs in the concrete floor of a silo such as double I; Y; E, square pad etc. A reputable supplier will recommend this. Every bin has a cold and warm side. This results in moisture migrating through the bin with condensation and concentrating in a section of the bin where the grain becomes hot and damaged and which may lead to smoldering eventually. Heat damaged grain cracks and eventually disintegrates. In the case of wheat, the baking quality is entirely destroyed. Aeration can also dry grain down somewhat (2-4%) provided ambient humidity is low or is burned off. Without a stirring or turning mechanism, very low heat should be applied so as to avoid heat damage to the bottom layers of grain. Pests and insects can also easily and effectively be controlled with an aeration system. Aeration is recommended for any grain being stored for more than 3 months, it is important to ensure that your system can be converted to incorporate aeration before you buy. Soil bearing capacity should be at 150kPa. If below this, an engineer should recommend a stabilizing procedure of the soil. This may included digging right through the level and backfilling and compacting the soil, to merely digging and stabilizing the soil with a cement mix and compacting.Foundations should cure for 5-7 days before the silo can be erected thereon and another 28 days before grain can be loaded therein. Flat bottom silos. Why the first choice? Over the silo life of 30+ years, any below ground level conical floor will leak because of soil movement, water table rising, floods etc. An above ground level foundation will stay dry and in good shape for many years. Cheaper & easier to construct. Full floor aeration can be properly installed. Poor aeration in conical silos. Movement inside the silo is easy. Sweep augers eliminate the need for collection in a conical bottom. No sump pump and water trap is required. Why would you consider a conical below ground level floor? A few extra tons storage is gained. One transport auger less can be used for small installations. No sweep auger is required. For short term storage not requiring aeration. How many grain types grades would you handle? If more than one two or more bins is better. 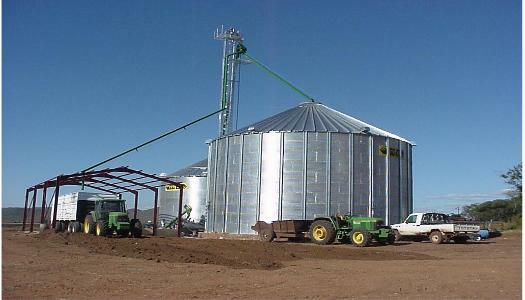 One large bin is always cheaper than two smaller bins for the same capacity but is it functional a large bin 10% full can only be utilized for one grade grain. Who do I deal with and who is the erector? Known suppliers erecting their own silos should be preferred in general. Subcontractors and indent agents often leave you with no security after an installation has been incorrectly completed. What brand am I buying? While small brand silos may be suitable, the really world class large scale companies would give you more peace of mind. 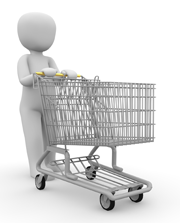 Avoid developing world manufacturers. It's a project that should serve you for 30 years, buy on quality, not on cost. What types of flat bottom silos are there? Farm storage bins purpose made to fill and empty up to 5 times annually. Drying bins purpose built for drying with heavier plates at the top rings to accommodate stirring equipment. These bins can be filled and emptied many times. Normally not designed to be higher than 12 14 rings. Heavy duty storage bins just what it says, with thicker wall sheets but without stiffeners, normally built not higher than 12 -14 rings. Heavier than commercial bins. Commercial "Super Bins" stiffened and used for higher bins 14 rings to 30 rings high. Make sure you compare apples with apples. Capacity : Make sure you work on cubic meters rather than "tons". Tons are not exact and can apply to various arbitrary densities. Some sellers include compaction of grain in their "tons" capacity. Others include the space in conical bottoms as "tons capacity" when quoting silos. Quality : See previous sections. Do not necessarily buy the least expensive bin. It's a 30 year investment. Buy the best quality for the purpose to be used. What is included? Inside & outside ladders? Eave platform? Spiral staircase? Rest platforms? Special OSHA certified ladders & platforms? Roof ladders? All these items cost money but may improve convenience, safety etc. Not too near your home dust and noise can be excessive. Secure many tons can be stolen from silos before you notice. Damage to grain and equipment may also result. Surface water ensure your silo can not be flooded and is elevated high enough with good drainage and above flood levels. Is there enough space for expansion ? Truck movement? Trailer movement? Is the site accessible from main roads? Are roads reliable? Electrical power can be expensive to move far.